Amethyst: known as nature’s tranquilizer, helps in sleep and in peaceful dreams. Connects physical to spiritual and is useful in connections between the 6th & 7th Chakras. Azurite: helps us to consciously look at old programmed beliefs and dissolve them. Charoite: helps to dissolve fears, both known and unknown. Hawk’s eye: helps us to see our lives as with aerial vision. Dk Blue Kyanite: Said to align all Chakras and never needs cleansing. Sodalite: helps in balance when one is emotionally or mentally confused. Encourages truthfulness in emotion, self-esteem and trust. Moss agate: helps to balance the left and right sides of the brain. Sugilite: helps to release resentment and guilt.Powerful, but expensive, helps us realize we are all one. Improves wisdom, protects the sensitive. Lapis Lazuli: Purifies the heart to make just decisions. Meditation support. Helps us to discover our hidden beliefs and bring them to the surface. 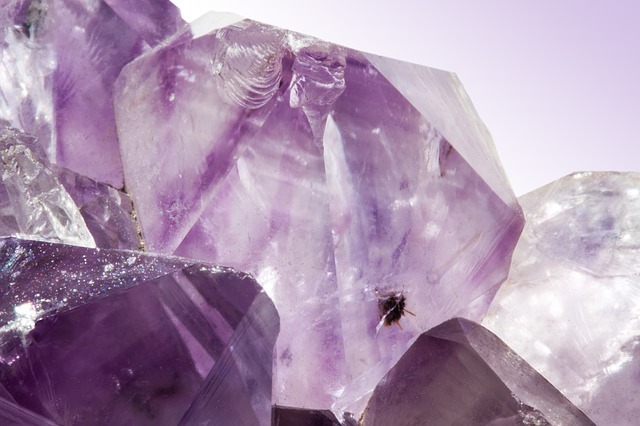 Purple Fluorite: Clear negative thoughts that hold us back. Repels evil and brings about higher states. Dumortierite: Help recall Past Lives, including knowledge and wisdom acquired during previous lives. Blue Aventurine: Opens Third Eye Chakra. Increasing awareness and insight.